The 32GR probe is a new generation slim gamma logging tool from Mount Sopris Instruments. It is all digital with newly upgraded electronics, has a slim 32 mm (1.25″) diameter, and measures the amount of gamma radiation occurring naturally within the formations crossed by a borehole. Gamma rays are produced mainly by isotopes of potassium, thorium, and uranium. This probe can be used for standard gamma logging and uranium exploration logging. The new digital communications mean dialing in the discriminator settings on gamma pulses is a thing of the past. All this is done downhole within the probe allowing for higher count rates and eliminating the pulse discrimination process. The tool can be run as a standalone tool or it can be coupled with a source carrier and small radioactive Cs-137 source for 4-Pi Density measurements. The 32GR runs on a standard MSI single conductor or a Gearhart-Owen four conductor cablehead. Versatile, ubiquitous probe which functions with a wide range of applications and borehole conditions. New smaller diameter (32mm, 1.25″) allows for logging through push rods and BQ core holes. Matrix .sub files can be modified to output gamma in API units or %wt U3O8 (percent weight Uranium). 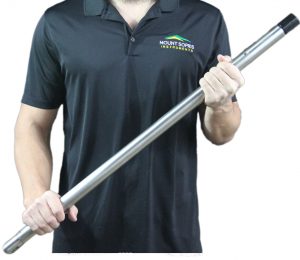 Mount Sopris manufactures more natural gamma and spectral gamma tools than any other borehole logging manufacturer in the world today. Digital communications mean dialing in discriminator settings on gamma pulses is a thing of the past. All this is done downhole in the probe allowing for higher count rates in high grade ore bodies. Weight 1.63 kg 3.6 lbs.